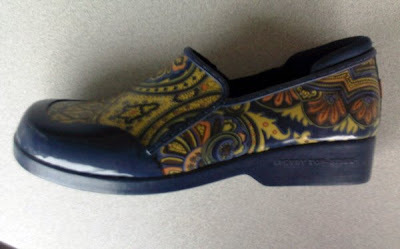 Well, if the fact that I'm going to Rolex doesn't make you green with envy, my new shoes will send you over the edge. Why would I buy anything BEFORE Rolex, when I'll be spending time at that huge equestrian trade fair? Because I need rubber boots/galoshes for the trip. But high boots just aren't that comfortable for walking. What to do? Enter Sperry Docksiders, remember those? The traditional docksiders were quite the thing when I was in high school in Indiana. But Sperry has apparently come a long way since my preppy-wannabe youth. 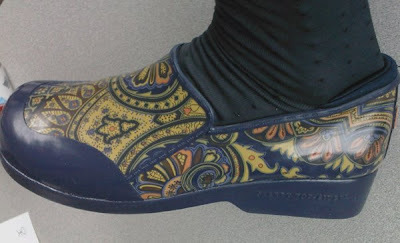 Meet the post-modern, polymer-based Dock siders: rubber,yes, but with fuzzy-soft-fabric-lined paisley footwear! The weather is forecasting clear skies, so while I may not need waterproof shoes, these are so comfy I'm wearing them as I dart around campus today in the wind and rain. Although no one has said anything about them, I feel certain I'm the envy of my colleagues. I ordered them online, and they fit perfectly, which as far as I'm concerned is proof that God really does love me. And now my credit card is all warmed up for the weekend. Those are awesome shoes, indeed! And now that your credit card is properly warmed up, I can't wait to see what the spoils of Rolex will be! Please buy some good stuff for those of us that are going to have to live vicariously through you this time. Believe me, if I were there, I would do my part! Have fun - can't wait to hear all about it. And they're real cute, too! Ahem. No fair inflicting Shoe Lust upon others without saying WHERE YOU GOT THEM...!?! 'cuz I am very, very jealous, and want some of my very own. Love the design! So kwel! Where did you find those? 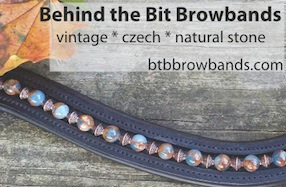 Care to share the link? stacey stacey (shakes head)... I'd stick with the topsiders ;) Have fun at the Rolex, I'm so jealous! Ladies, the shoes can be found on amazon.com and I think on the Sperry Web site. Also different designs as well. credit card needs a chill.